Yes! And one way this Scripture verse is being fulfilled is through cutting-edge photo technology! While the naked eye is clearly seeing things in the sky as never before, 21st-century technology is adding to the prophesied “signs and wonders” in the sky! Space colony! To see what you have probably never seen before, click here! https://www.youtube.com/watch?v=veo5h4ayR78 Indeed, if Robert Bateman were still alive, these true space colony stills would be his next artistic series! How welcome it would be to see such a marriage of art and science! This space colony is to far away to be a CERN-sponsored hologram. It appears holograms, at the moment, are more simplicstic objects like suns, moon, faces, etc. The Middle Eastern branch of CERN in Jordan has been experimenting with a two-sun hologram over Jerusalem. 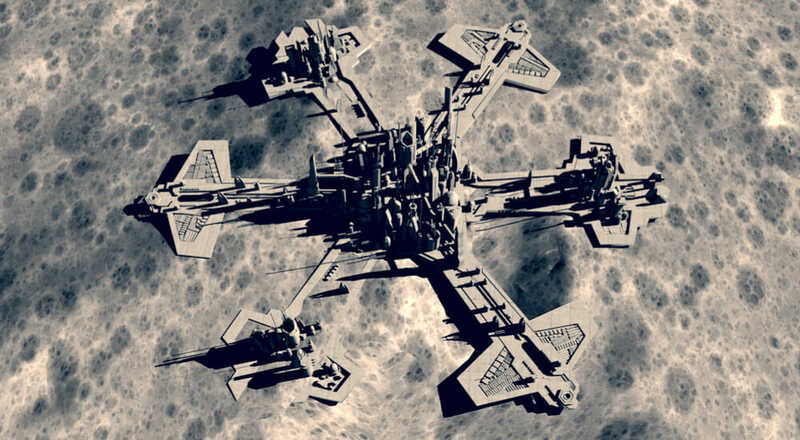 This space colony, however, is too elaborate in detail to be a hologram. Too, this could be a clandestine New World Order operation, sending everyone’s tax money into space. But then, why the Middle Eastern architecture? To unify its world government, the NWO will soon use UFOs as a “borderless external threat” calling for all nations to unite under a central world government to deal with it, as they are told is also the only solution for the “internal borderless threat” of pollution. However, it should not be overlooked that the New World Order, with its unrestrained addiction and fetish for colonization, have also extended their colonizing mindset into space. After all, what are taxes for? Alleged Nazi scientists in Antarctica may be to blame. In 1945, three USAF MIT engineering officers were discovered with a newly-constructed UFO in a USAF warehouse on Washington state. Their UFO blueprints were recently stolen from Nazi in Germany and given to them. The MIT officers revealed the blueprints were coped from ancient sources. Two years later, when they went to move them, the Kenneth Arnold “sightings” appeared, the best propagandists went to work, and you know the rest…. But from a Christian viewpoint, what are we to believe? Are these demons, angels, or harmless extraterrestrials simply observing us? Regarding the latter, it would be selfish for Christians to believe the billions of planets in our universe contain only one with inhabitants. In the Bible, the “First Heaven” is our atmosphere and the “Second Heaven” is where the demons still operate. Could this space colony have an affinity, more than we think, with a Darth Vader’s minions? It seems possible when seeing the very orderly way the little white UFOs come and go from this space colony. Or, as Christians, could this be one of many Rapture sanctuaries, ready and waiting to bring us out of this mess and into a Divinely-sanctioned place of tranquility, peace and safety?